Voweletics is rewarding for both parent and child. Multi-sensory components (visual, auditory and kinesthetic) are used in each lesson. These components encourage the use of the analytical left brain and the creative right brain. This technique facilitates rapid comprehension and memory recall. Voweletics students demonstrate acceleration in decoding skills, reading fluency and overall comprehension. Significant results can be see in as little as 10 weeks, and smiles can be seen in as little as 10 minutes! Let Voweletics help you guide your child down the path to successful reading. Our step-by-step teaching tutorials give you the essentials to take the frustration out of helping your child with reading. Whether your child needs additional support or accelerated skills, Voweletics provides the way. You know those phone numbers or company names you always remember because they are tied to a catchy jingle? We do, too! That's why we created original songs with our own catchy beats to help your child remember the vowel sound rules. Let's kick it off with the Voweletics Medley song below! Word Lists provide vowel sound practice and help your child build vocabulary. Each Word List is accompanied by a read-along audio file to enhance fluency. Cumulative Word List Reviews assess which vowel sounds may need to be reviewed. Self-checking word sets with audio files build high frequency word proficiency. Continuously practicing sight words and sight word phrases improve your child's reading comprehension. Progress tracking charts for sight words and sight word phrases can be found in the back of the Workbook. Completing these charts gives your child the feeling of accomplishment. Voweletics provides learning activities precisely coordinated to meet your child's needs. These tools are all you'll need to put the joy into learning to read! 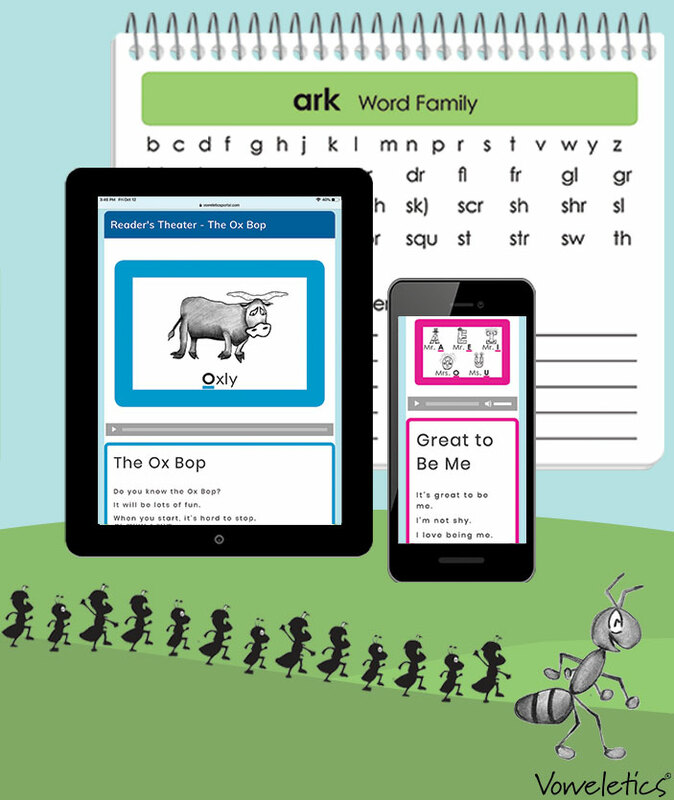 Teaching songs, word sorts, stories, poems, fluency audio files and charts... our strong array of reinforcements to support your child every step of way. Throughout its 26 lessons, Voweletics has creatively layered into a storyline, characters that engage children and get them excited to read. Each new vowel sound has a unique character that serves as a guide word. The Voweletics characters live in Readersville, the enchanting town where learning takes place! Each delightful character not only serves as the guide word, but teaches life values through their song lyrics, stories and poems.